Cantaloupes have been linked to listeria in the past: in 2008 it was imported from Honduras, In March 2011 tainted cantaloupes were from Guatemala. This time the source is whole cantaloupes grown at Jensen Farms in Colorado. According to CDC, as of September 26, 2011, a total of 72 people were reported to be infected with the four outbreak-associated strains of Listeria monocytogenes. All illnesses started on or after July 31, 2011. 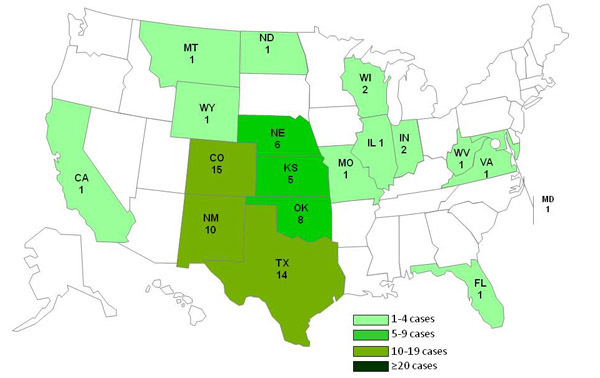 The number of infected persons identified in each state is as follows: California (1), Colorado (15), Florida (1), Illinois (1), Indiana (2), Kansas (5), Maryland (1), Missouri (1), Montana (1), Nebraska (6), New Mexico (10), North Dakota (1), Oklahoma (8), Texas (14), Virginia (1), West Virginia (1), Wisconsin (2), and Wyoming (1), as color-coded on the map. 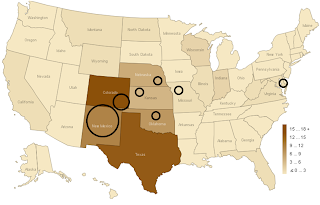 Thirteen deaths have been reported: 2 in Colorado, 1 in Kansas, 1 in Maryland, 1 in Missouri, 1 in Nebraska, 4 in New Mexico, 1 in Oklahoma, and 2 in Texas (shown as black circles on the upper map). As of November 1, the number of infected people increased as follows: Alabama (1), Arkansas (1), California (2), Colorado (39), Idaho (2), Illinois (3), Indiana (3), Iowa (1), Kansas (10), Louisiana (2), Maryland (1), Missouri (6), Montana (1), Nebraska (6), Nevada (1), New Mexico (15), New York (2), North Dakota (2), Oklahoma (11), Oregon (1), Pennsylvania (1), South Dakota (1), Texas (18), Utah (1), Virginia (1), West Virginia (1), Wisconsin (2), and Wyoming (4). Most people infected with Salmonella bacteria develop diarrhea, fever and abdominal cramps 12 to 72 hours after infection. The illness usually lasts 4 to 7 days, and most people recover without treatment. However, in some people, the diarrhea may be so severe that the patient needs to be hospitalized. Salmonella infection may spread from the intestines to the bloodstream, and then to other body sites and can cause death unless the person is treated promptly with antibiotics. Symptoms of salmonellosis include diarrhea, fever, and abdominal cramps. They develop 12 to 72 hours after infection, and the illness usually lasts 4 to 7 days. Most people recover without treatment. But diarrhea and dehydration may be so severe that it is necessary to go to the hospital. Older adults, infants, and those who have impaired immune systems are at highest risk. click here for the causes of this bacteria.If you only have diarrhea, you usually recover completely, although it may be several months before your bowel habits are entirely normal. A small number of people who are infected with salmonellosis develop Reiter's syndrome, a disease that can last for months or years and can lead to chronic arthritis. good efficiently linked your Chromecast to your compatible device, Mobdro Chromecast After that only you will have the ability to download it nice. Thanks for providing useful information . I found some really interesting stuff in your blog especially this discussion. Keep up the good work. This seems really dangerous man! Never heard of this disease before. Thanks for its awareness. Kindly post some precautions and remedies for this too. Hi i could understand this content but what is "Listeria "? Regards when remarkable skills. You ought to let your catch determine thus quite frankly purely natural alongside delivery service, yet Information discover about this approach change lives that should be quiet core part which I take for granted a free you should never fathom. Already go along with right General Contractor Westchester County Maintain just for remarkable adventure.